Blitz story from Mr D Kite. 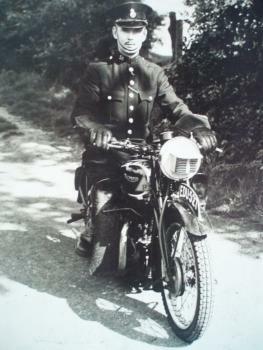 Wilfred Kite, in uniform on his motorcycle. Note the deflector on the headlight to comply with blackout regulations. My father, Wilfred Kite, was a Coventry Police Officer. He was on duty on the night of the Blitz, 14 November. After the bombing started it became apparent that it was going to be a big raid and he told me that he was instructed to fetch the Assistant Chief Constable (who presumably was off duty) by car from his home in Burton Green. This is a high point and when my father arrived Coventry was visible with fires and explosions. The Assistant Chief Constables' wife was terrified for his safety and pleaded with him not to go, but despite this the two drove back to the city. My father later saw Coventry Cathedral on fire. We lived in Green Lane. At the junction of Green Lane and Coat of Arms Bridge Road there were some large trees which still remain today. Following an air raid the residents were curious to see a large cylinder hanging from a parachute caught in one of the trees. The cylinder was about the size of a postbox and no one knew what it was. It turned out to be a landmine and the whole area was evacuated whilst the bomb disposal team tackled it. It was later driven to Hearsall Common. My mother, Ailee Kite, told me how one afternoon she was leaving the house with my brother in his pram when a German aircraft passed over the houses opposite, so low she could see the pilot looking at her! Lord Haw Haw, the German broadcaster, later reported that a pilot had been awarded the Iron Cross for bombing the Standard Motor Company factory and mocked that it was possible because the anti-aircraft gun crews were playing the "early-closers" at football. This being a reference to the fact that all shops closed on a Thursday afternoon - the time of the raid - and the shop workers had a football team. In a recent letter in the Times the writer recalled as a lad seeing a Heinkel III, a small German bomber, flying low over Kenilworth along the railway line. Since this line passes close to Green Lane the two sightings may be related. Often when researching your family history, you will come across old photographs of ancestors and relatives. Estimating the age of a family photo can give you helpful clues and insights as you uncover your family tree. Using a collection of old photographs from different eras, Jayne Shrimpton demonstrates the techniques of using costume and background to identify their date.